Marbella has a sunny climate with an annual average of 18ºC. It has natural landscapes, luxury gardens and beaches, as well as the beautiful Sierra Blanca. There are two mountain peaks that crown this region: 'La Concha' (1212 m. high) and 'El Juanar' (1182 m. high). They both offer fantastic views of the entire region. 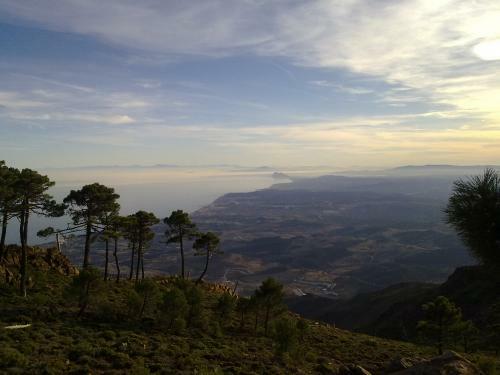 Both 'La Concha' and the 'Puerto Rico Valley' have wonderful views of Marbella’s surrounding areas. Plus, there is also a huge variety of plants, flowers and animals, nature lovers can be sure they will find a great deal of joy and pleasure discovering what Marbella's countryside has to offer. Many of the tourists that visit Marbella come looking for the natural beaches that can be found from Cabopino to Guadalmina, with fine sand in which to find our favourite spot to sunbathe an enjoy the Mediterranean. The beach of Marbella begins at the fishing port and ends in Puerto Banus and there is a path where we can stroll along and admire the beauty of the area from the Hotel Don Pepe till Puerto Banus, a walk along pressed earth and surrounded by nature. During our stroll along the coast we’ll find rocks packed with shellfish and a eucalyptus forest where we’ll find the Ancon Tower that dates back to the 16th century. We’ll find Marbella’s most beautiful trekking routes by crossing Sierra Blanca, Sierra Canucha and Sierra de las Nieves, along paths where we’ll enjoy spectacular views of both the sea and the mountain, rich in flora and fauna. To get there we must find the A-355 road that goes from Marbella to Ojén. Once you’re at the viewpoint, if you still have a bit of energy in you, you can continue ascending till the top of the Juanar Cross. A beautiful route through which we’ll cover the riverbed of the Calaña stream until we reach the ruins of a chapel built by Christians many years ago. Also known as the path of Jose Lima, an old forest ranger of the area, this route begins in the old path of hunters. A route that begins in the top part of Istán, from where we’ll see the water reservoir and the Hotel Altos de Istán.